A space to score the hip clothes, jewelry, books and novelties that haven’t worn out their welcome. Specializing in fashion and gift trends that are just beginning to crest, Alisa Loftin's funky, pink-striped double storefront is packed with hipster treats. 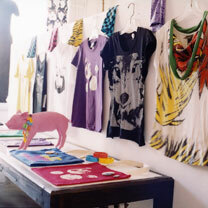 Rock and roll inspired graphic tees by T&xt look cool paired with Chrishabana‘s ’80s punk Lycra leopard print leggings. Sandals by Huyl, Crate jeans, Figmint slim-line 60s-style trousers and deconstructed Elmer Ave suitcoats are featured. A veritable zoo of Fauna‘s animal-shaped silkscreen pillows perch on vintage chairs in the back.